Even if you don't make waffles that often your iron can still be used to prepare food. This is a guide about cooking uses for a waffle iron. We use the waffle iron for making cornbread! Mix all together and bake in waffle iron on medium for 2 minutes. Drop by teaspoonfuls. Watch carefully. For frosting: Boil chocolate, brown sugar and water together to dissolve, then add powdered sugar, vanilla and butter. This should make a thin consistency. 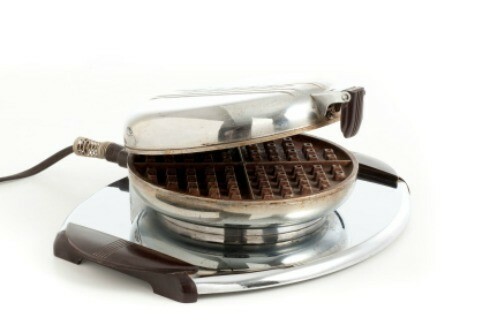 Other uses for the waffle iron? I read somewhere about making grilled cheese sandwiches. Anyone got a great waffle recipe while you're at it? Note: this is in Euro-style, with weights rather than cups...and metric! I forgot to write down the standards! Mix egg yolks and milk. Add flour, baking powder, sugar, salt and mix well. Add the oil. Beat egg whites until stiff and fold into batter. You can add berries, bananas, or mini-choco chips if desired. My boys like PBJ sandwich-style. For the best dessert in the world (fast and tasty) mix up a box of cake mix according to directions and then pour it into the waffle iron and make cake waffles. Serve with fresh fruit (chocolate cake and raspberries is yummy) and whipped cream. Looks very elegant, tastes wonderful, easy as can be to do. This is a very easy recipe for waffles. My mother has been making this recipe for years. And I have been asking for it for years. She didn't have a recipe, she just threw things together and came out with good waffles every time. Probably some of you have mothers like that or you are a cook like that. But I go by the directions for the most part because I am not a cook like my mother. 4 heaping plastic teaspoons of baking powder (well this is not so exact, probably "rounded" would be a better term). 3 large eggs (or 4 medium). In one bowl, beat the eggs until mixed, then add the other liquid ingredients and stir until mixed. In another very large bowl, mix all the dry ingredients. Pour wet ingredients into the large bowl of dry ingredients about a third at a time and mix. I use a large wooden spoon to do this. You might to use a mixer. When all of the ingredients are mixed, let the bowl sit for about five minutes. Stir again. If the batter is too thick, add a little milk. If the batter is two thin, added a little flour. Stir. This is where I begin to sound like my mother: the batter should be the consistency of karo syrup. (help me out here). It shouldn't be watery and it shouldn't be hard to stir. It should be somewhere in the middle. Just put in the waffle iron and bake til done. We have used this recipe for years. It is easy, it is a lot more nutritious than the boxed waffle mixes (look at all the eggs and milk). It could probably be more nutritious if you added some wheat flour. (If it is all wheat flour it will be heavy). I grew up on "waffle" toasted cheese sandwiches. Just put the sandwich together as usual and instead of frying in a pan, put it/them in the waffle iron. I have a large square one and can fit four sandwiches made on standard bread. My favorite is pecan waffles. Any type of pancake mix will work. just add a little more fat to crisp the waffle. and if you want that authentic waffle house taste add a little malt powder (available by the chocolate milk powders.) Sprinkle chopped pecans on the waffle iron and pour the batter over them. bake as usual. Have lots of butter and syrup ready. yum! My mom always made grilled cheese sandwiches with her waffle maker, but the waffle plates turned over to flat grill plates, which is what we used for the sandwiches. By the way, a little george foreman grill can be used for a grilled sandwich called a pannini.